Know how to use an 8-pin DIP IC, e.g. from tutorial 5. Read about operational amplifiers (op-amps). To make the light level at which the LED switches on adjustable, you will also need a 100k trimpot. Two circuit diagrams have been included. 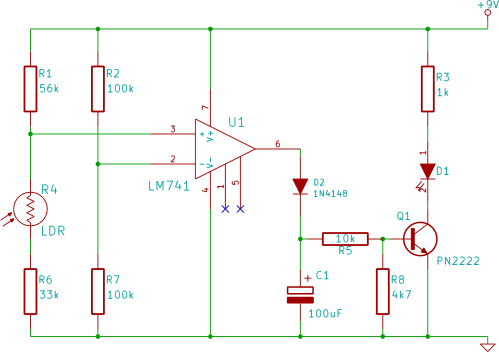 The first diagram shows the automatic light circuit using a fixed light level to automatically switch the LED on. The second circuit adds a trimpot to make the level at which the LED switches on adjustable. The LM741 IC is housed in a 8-pin DIP, so normal DIP IC pin numbering applies to it. If using a bright LED, place the LED away from the LDR. A photo of the completed breadboard circuit is shown below. Click the photo for a bigger image. Cover the LDR to restrict light to it and the LED will switch on. If you have built the circuit with the trimpot, then adjust the trimpot so that the LED switches on at the desired light level. Do this by covering the LDR so that the desired level of light is reaching it. Now adjust the trimpot until the LED just switches on. Keep the LED away from the LDR. 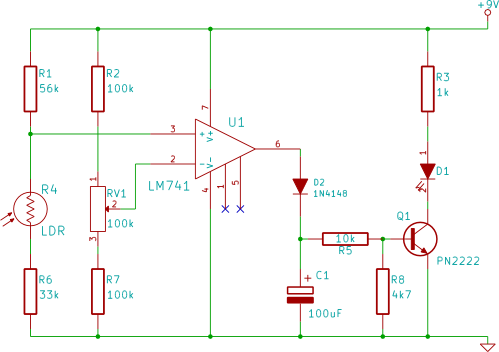 If the light from the LED is bright enough and it reaches the LDR, then the circuit will switch off because there will be enough light reaching the LDR. After the circuit switches off, the light from the LED will no longer reach the LDR which will cause the circuit to switch the LED on again. The circuit will carry on "oscillating" like this until there is enough ambient light, or the light from the LED is prevented from reaching the LDR.